A team of George Washington University entrepreneurs is looking to revolutionize the health care industry by providing more accessible primary care options to a community’s most vulnerable population. Freya Spielberg, an associate professor at the Milken Institute School of Public Health and director of GW’s community-oriented primary care, founded the startup Urgent Wellness, which plans to develop telemedicine and medical vending machines staffed by community health workers to lower health care costs nationwide and improve access for homeless and low-income patients. These resources would be put into homeless shelters and housing projects to provide more convenient preventative care for Medicare and Medicaid patients, Dr. Spielberg said. It would also decrease reliance on emergency room services. Urgent Wellness was awarded more than $25,000 at this year’s New Venture Competition and took home the $15,000 first place prize. Dr. Spielberg said years of working in urgent care in underserved areas have made her passionate about health care disparities. Thirty-two percent of Medicaid patients use the emergency room once a year at least, and about 37 percent of those visits could be avoided, said Dr. Spielberg. When patients overuse these services, health care costs rise. The only way to improve this problem is by creating a system that can be paid for by insurance and provides a new kind of routine care, she said. “I see the need, and I see the solution, and we have the technology now to make this work so it’s really just time,” she said. Dr. Spielberg and co-founder of Urgent Wellness Aubrey Villalobos, director of comprehensive cancer control at the GW Cancer Center and a graduate student in the Milken Institute School of Public Health, presented their pitch Thursday at Jack Morton Auditorium. The team also included Luigi Leblanc and John Barabino. Urgent Wellness participated in the DC I-Corps cohort, where they conducted dozens of customer development interviews to better understand their market. Twelve teams presented business proposals during the ninth annual New Venture Competition and vied for more than $300,000 in cash and in-kind prizes. The competition was split into three tracks—social ventures, technology ventures and new ventures—with four finalists in each category. Proposals ranged from new ways of thinking about food waste, an on-the-go makeup kit and technology that would allow gardeners to save money on irrigation by taking advantage of natural condensation. The competition is put on by the Office of Innovation and Entrepreneurship and the Office of the Vice President for Research. In the past nine years, 40 percent of finalists have launched their companies and 26 startups have been formed, said Jim Chung, associate vice president for research, innovation and entrepreneurship. 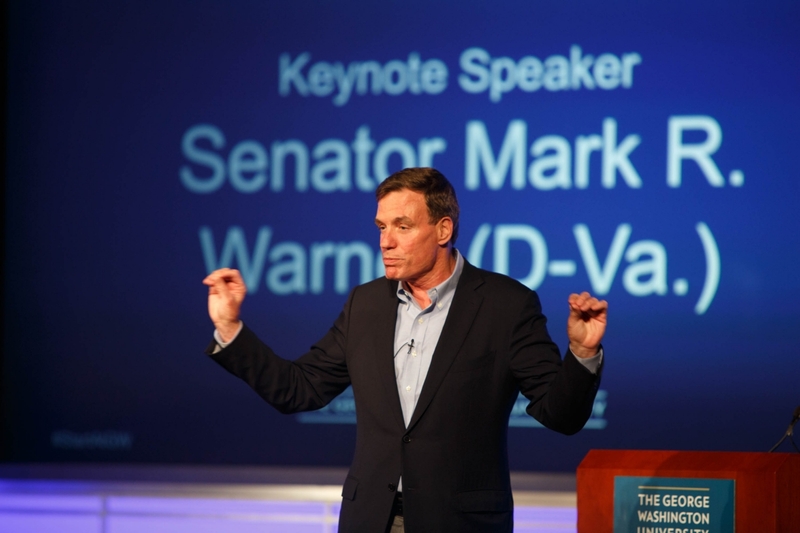 George Washington President Steven Knapp introduced Sen. Mark Warner (D-Va.), who gave a keynote address about his experience in the business world. Mr. Warner, B.A. ’77, was an early investor in the cell phone pioneer Nextel and became a prominent business operator and political leader. Before he was successful, however, several of his ventures failed. Two companies he invested in after graduating from Harvard Law School went bankrupt. His path to where he is today was not a straight line, he said. 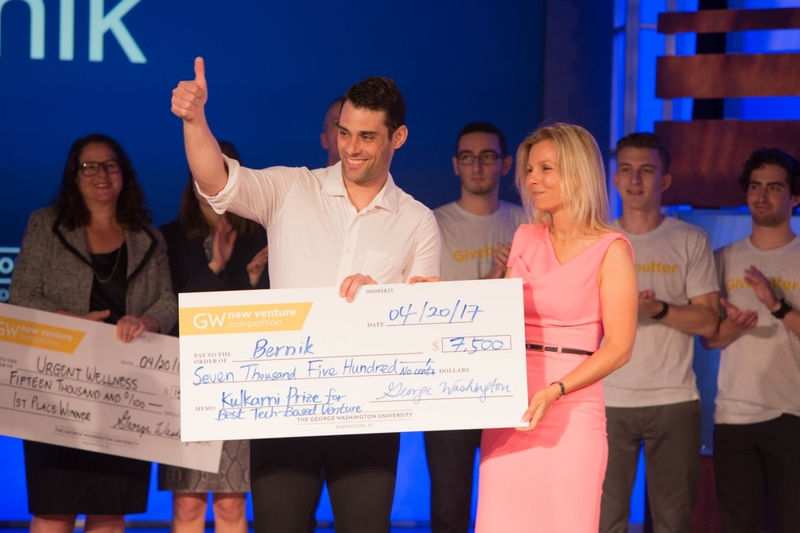 “At the ripe old age of, I think I was 26½, I had student debt, I was sleeping out of my car and unlike a lot of my GW classmates and law school classmates, I decided I would try it one more time,” he said. In 1982 when Mr. Warner got involved with cellular phones, his friends told him there was no way people would want a phone in their cars. Mr. Warner believed in the technology, and it paid off. That spirit of innovation and entrepreneurship is uniquely American, he said. In the past 30 years, all of the net new jobs in the United States have been created by startups, Mr. Warner said. Some of those go on to become Google, Facebook and Under Armor, but many don’t but still provide good paying jobs. The challenge facing the country is distributing this job growth outside of hotbed markets like Silicon Valley, New York City and Austin, Texas. Mr. Warner encouraged students thinking about starting a business to launch it in their local communities. He is concerned, however, that young people today don’t have the same advantages he did when he entered the business world. The workforce has changed significantly over the past 40 years. Employees no longer work for one company their entire lives and climb the corporate ladder because so much of the workforce depends on temporary employment. Student loan debt is also crippling young people’s ability to take risks, and low-income employees are getting insufficient training to adapt as factory jobs disappear. The values of young people across the political divide give him hope, Mr. Warner said. Millennials put a premium on companies with social values that makes it a priority in the marketplace. The ability to adapt is also critical. Mr. Warner said he has never invested in an entrepreneur who met his or her original business plan and emphasized the importance of teamwork. You can watch and hear Warner’s full speech here. School of Engineering and Applied Science alumni Vicki Gumtow, B.S. ‘91, and Karl Gumtow, B.S. ‘92, received the 2017 Distinguished Entrepreneurial Achievement Award, presented by David Dolling, SEAS dean. The Gumtows started CyberPoint, a cybersecurity company, in Baltimore in 2009. Daniel Berg, a junior majoring in health and wellness and organizational sciences, was awarded the second place prize for his company Berg Bites, which produces a healthy snack marketed toward gym-goers with a sweet tooth. Mr. Berg and his team were awarded $25,000, including the $10,000 second place prize, $10,000 for the best undergraduate proposal and an additional $5,000 for making it to the finals. Mr. Berg said receiving the awards was a surreal experience. As a health conscious middle schooler, Mr. Berg decided one day his family needed to get rid of all the candy and sweets in their New York home. They came up with energy bites made from oats and coined them Berg Bites. Today Mr. Berg has launched three different flavors and is planning another this summer, along with a week-long pop-up shop in New York City. One hundred student groups advanced as quarter finalists in the annual innovation and entrepreneurship contest.